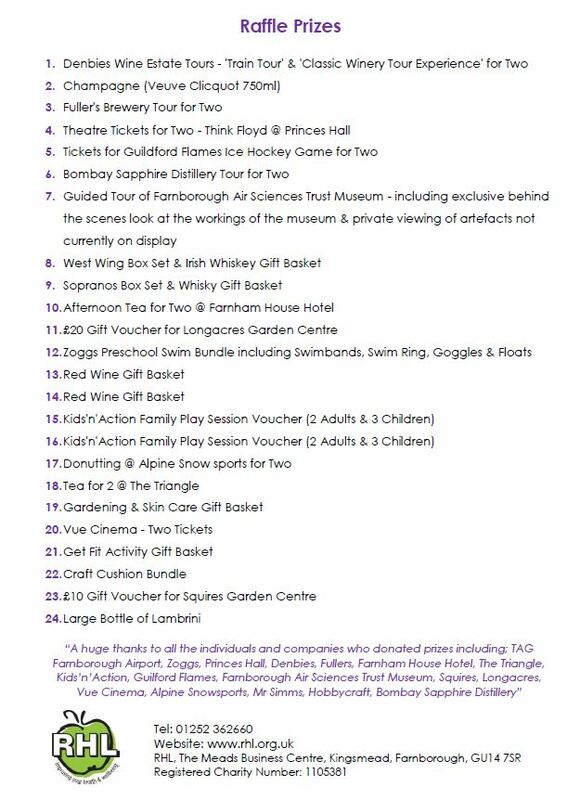 We’ve got some fantastic prizes for our 2018 Xmas raffle and are trying to sell as many tickets as possible – we hugely appreciate your help in supporting us to make this our biggest fundraising event to-date. Tickets can be purchased from the RHL offices as well as our exercise class tutors. Good luck to one of our trustees, Catherine, who will be running 5K on 27th October 2018 in support of RHL. This is the first time Catherine has done anything like this and she would really value your support – please do consider sponsoring her! A huge thanks from all of us at RHL. RHL Great Step Challenge 2018 - A step towards fitness! The RHL Great Step Challenge is suitable for all ages and all levels of fitness/ ability. 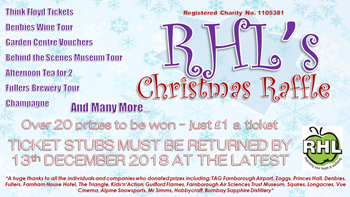 It will not only raise money for RHL, but will also help participants take a step towards increasing their fitness whilst having lots of fun. 2- ‘RHL's Move It Challenge’ - this challenge is suitable for all adults. It provides an alternative to the Step Challenge. It offers options for both standing and seated exercise with varying levels of difficulty. Simply complete 10 minutes of additional activity per day, choosing from a range of suggested exercise ideas. Pick what suits you! Click here to download the Move It Challenge pack with seated and non-seated options. The last day turned out to be very eventful, with Simon feeling really ill but determined to get to Land’s End, he started cycling an hour before Patrick and Scott as he would have been unable to average 17 mph for 95 miles. At noon they were hit by a cold front, with very heavy and freezing rain. Simon was riding in these conditions for about an hour and was so cold and wet that he made an unscheduled stop at a pub and rang for help. Luckily there was a signal as there hadn’t been for about an hour. When Roger arrived he was shivering so violently that he was having problems drinking a cup of tea! Roger phoned Patrick and Scott who then joined us and ordered two bowls of hot soup each, plus sausage and mash for Patrick. Simon fell asleep at the pub and despite his dad telling him to abandon the ride only 35 miles from John O’Groats because he was so ill there was no stopping him. They changed into dry clothes and added extra layers, and with Patrick and Scott shielding him for the rest of the ride, they made it to John O’Groats! 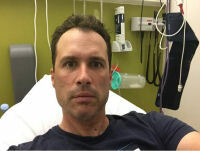 Simon has subsequently admitted that he felt dreadful for a couple of days and on Sunday night he was within a ‘gnats ‘whisker’ of calling an ambulance as he had a temperature, was violently shivering and had passed out. Instead of keeping to the original plan of driving home, Simon flew back to Heathrow and was collected by his brother Tom and Mum Alaine who persuaded him to call 111, where a doctor told him to go to A&E at Frimley Park Hospital. He was put on a drip and after some blood tests was told that he had a viral GI virus and with some medication was then discharged. We hope Simon feels better soon and, once again, a massive thank you to Simon, Patrick and Scott for their fantastic achievement in cycling over 1000 miles to raise money for RHL! A huge thank you to Roger as well, for his hard work driving the Support Car, looking after the guys and washing lots of very sweaty lycra at the laundrette! We wish Simon, Patrick and Scott a safe journey back to North Carolina!